Thanks and praise for winter rains. Drought reminds us to treasure - whatever Nature can spare. Thanks and praise for emerging seedlings. Each one a tiny miracle, hope for the year to come. Thanks and praise for new spring foliage. Our spirit needs the fresh green color – our bodies, the sustenance. Thanks and praise for native wildflowers. Their beauty quickens the heart; they are truly gifts to gladden the soul. Encouraging plants to grow, enticing us into the fragrant garden. Thanks and praise for the fogs of June. They bring magic to the garden, providing water for thirsty plants. Thanks and praise for Mother Nature’s pollinators. From hummingbirds to the smallest bees, they safeguard the precious cycle of life. Thanks and praise for the ripening harvest of summer. The fruits and vegetables, nuts and seeds - food for all the garden’s creatures (including us). Thanks and praise for the dry winds of September. They cleanse the garden, ushering in the tranquility of the dormant season. Thanks and praise for the dormant season. The golds and browns rest the eyes, providing a calm background for busy lives. Thanks and praise for the creatures of fall. Insects, migrant birds and countless wee beings, each filling their niche in the life of the garden. Thanks and praise for our many human friends. Their hard work, suggestions, love and donations - an evolving inspiration throughout the year. Few plants are blooming now in Mother Nature’s Backyard. And those that are have already been featured as Plants of the Month. But one of our favorite ground covers is perking up with the recent rains and cooler days. 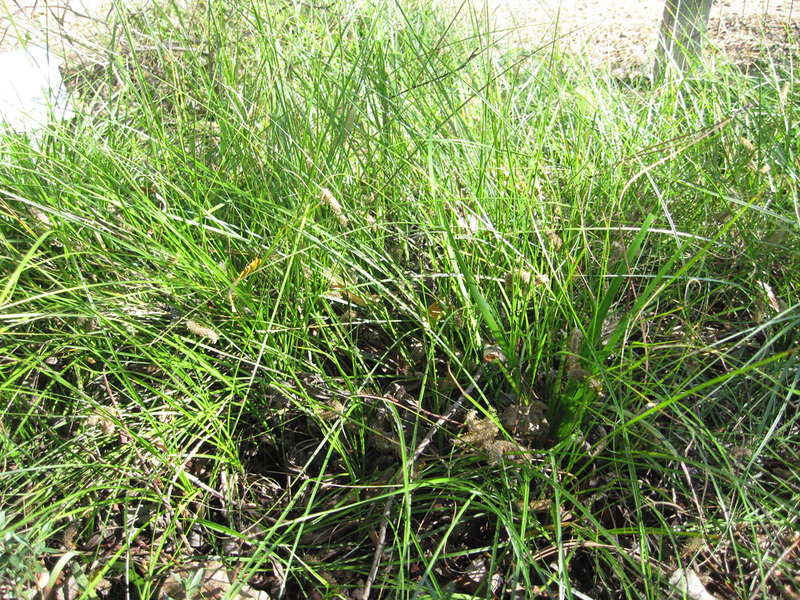 So we’ve chosen Clustered field sedge (Carex praegracilis) as our Plant of the Month. The species name is pronounced CARE-ex pre-GRASS-ill-iss. 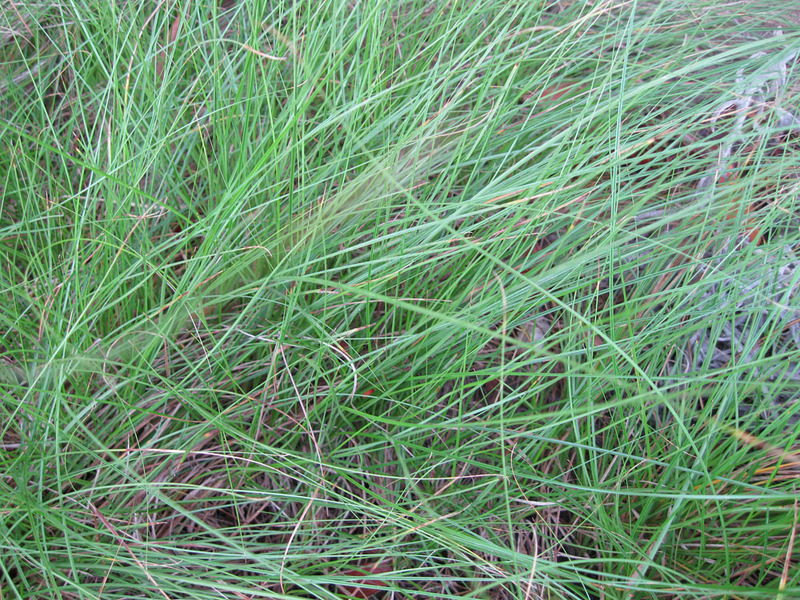 The sedges (genus Carex) are perennial, grass-like plants that grow in climates ranging from the tropics to the tundra; sub-Saharan Africa is the only continent with few species. Most of the several thousand species grow in boggy, marshy places or near ponds and streams, but some are more drought tolerant. 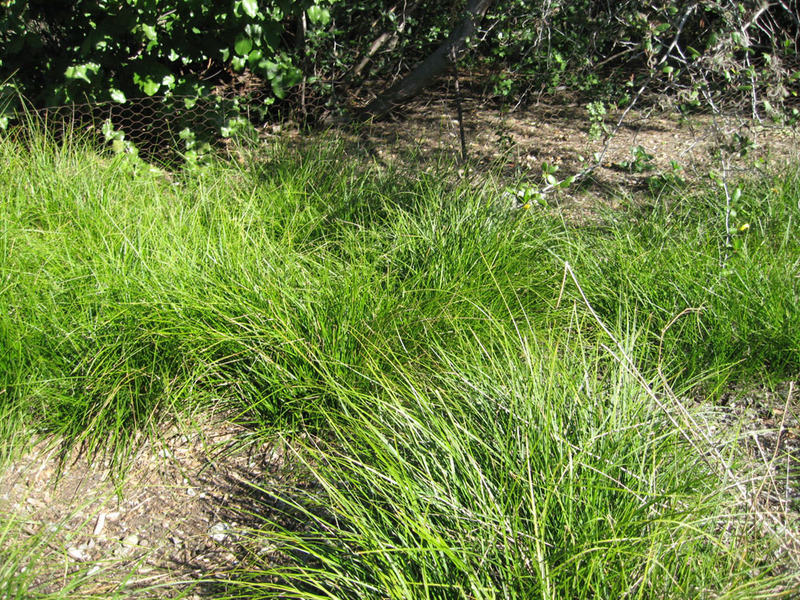 There are over one hundred and thirty Carex species native to California, the vast majority growing solely or mostly in the Sierra Nevada Mountains or the mountains of N. California. However, about 20-25 species are native to Los Angeles County or the S. Channel Islands. While most of them grow only in the San Gabriel Mountains, a few can be found in the lowlands as well. Carex praegracilis is one of them. 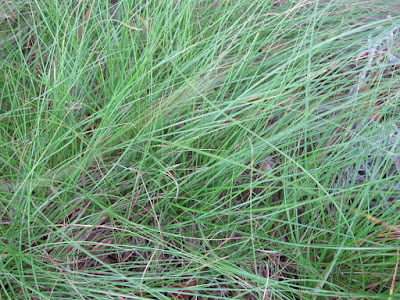 The leaves of sedges are long, narrow and grass-like. 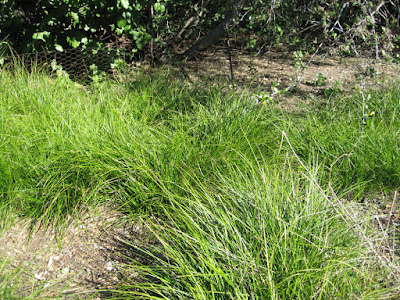 In fact, many people mistake sedges for grasses. But sedges are actually close cousins, belonging to a different family entirely (the Cyperaceae) and having flowers quite different from those of the grasses. In fact, the flower stalks of the sedges are triangular in cross section. The old saying 'sedges have edges, rushes are round, grasses have knees that bend to the ground' helps one remember a key difference between the grass-like plants. 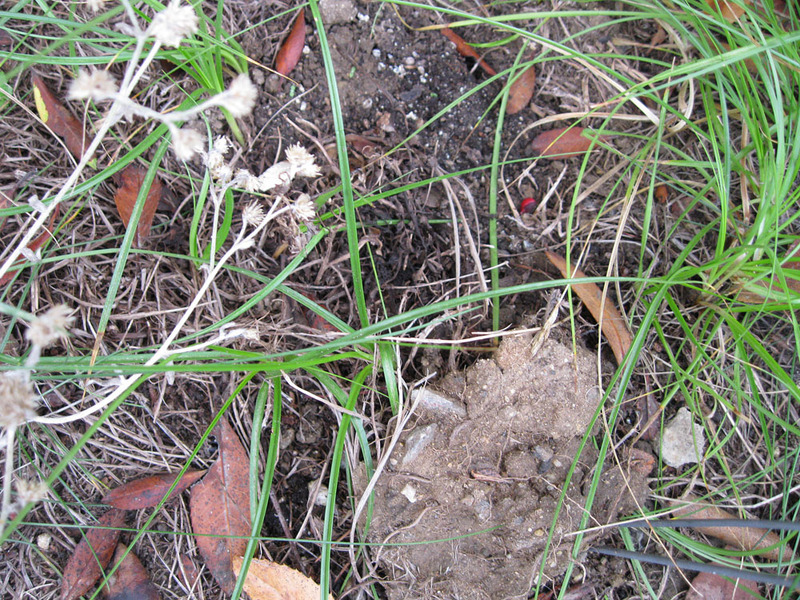 Most sedges spread by rhizomes (underground stems), stolons (‘runners’) or roots, forming a lawn-like sod. 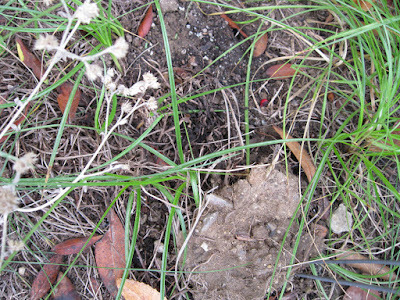 Sedges are used in some areas as a substitute for lawn grasses. Clustered field sedge has a wide geographic range – from mid-western U.S. to the west coast. In California, it grows in the California Floristic Province and desert mountain ranges, from sea level to about 7000 ft. (2500 m). It once grew along the LA River, Ballona Creek and marshes, on Santa Catalina Island and in the Liebre, Tehachapi and San Gabriel Mountains. It likely was common, but unrecorded, in many other moist places in the lowlands of western Los Angeles County. In S. California, it occurs in/near both freshwater and alkali wetlands, including those that are only seasonally wet. In the horticultural trade, Carex praegracilis is sometimes confused with (and sold as) Carex pansa, a shorter species native to several areas along California’s central and northern coast. Both are similar in appearance and use in the garden. But there are important differences between the two, including size: Carex pansa is only about 6-8 inches tall, while Carex praegracilis is slightly taller. For a great discussion of the two species (and how to tell them apart) see reference 4, below. Clustered field sedge is a perennial with narrow, bright to medium green leaves typical of sedges. The leaves are slightly more narrow and longer than Carex pansa. It grows about 1-2 ft. tall and looks superficially like a fine-bladed grass. 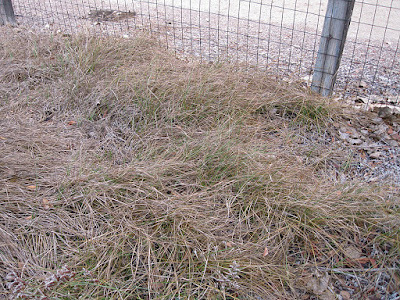 In fact, the species is commonly used as a grass substitute. 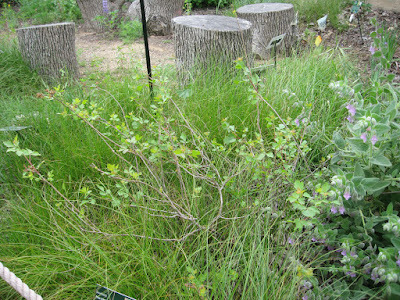 It spreads via stout, dark rhizomes (underground stems) to form a sod-like mat. This species is a very useful addition to local gardens. It tolerates full sun to part-shade. We’ve found it looks best in part shade, and even have a nice stand growing north of a 10 ft. wall in Mother Nature’s Backyard (see below). 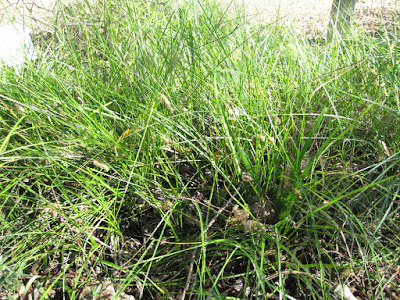 Carex praegracilis does fine in most local soils, from sandy to clay (we’ve grown it in both extremes). It doesn’t mind the alkali soils found in some parts of our region. Clustered field sedge really needs no added fertilizer, though it probably wouldn’t harm it. 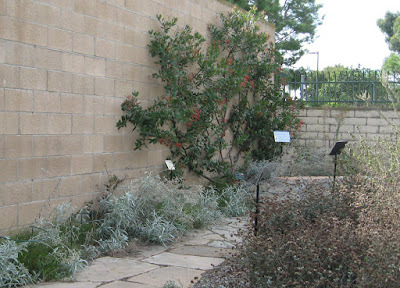 While young plants need regular water, established plants are quite drought tolerant. Carex praegracilis can get by with infrequent irrigation (deep watering several times a summer), though plants will go dormant. 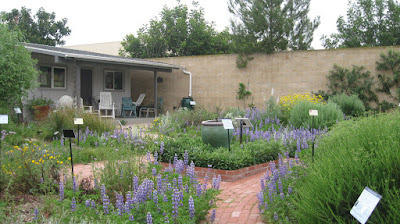 To keep established plants green, water every 2-4 weeks, depending on soil type. Taper off water in the fall, to give plants a bit of a rest. Like most Carex species, Carex praegracilis is best started as a purchased plant or as plugs. In our experience, Clustered field sedge spreads more slowly than Carex pansa, taking several years to really establish in western Los Angeles County. It may fill in more quickly in wetter regions (or with more irrigation than we give it). If used as a lawn substitute, we suggest planting plugs 8-10 inches apart. 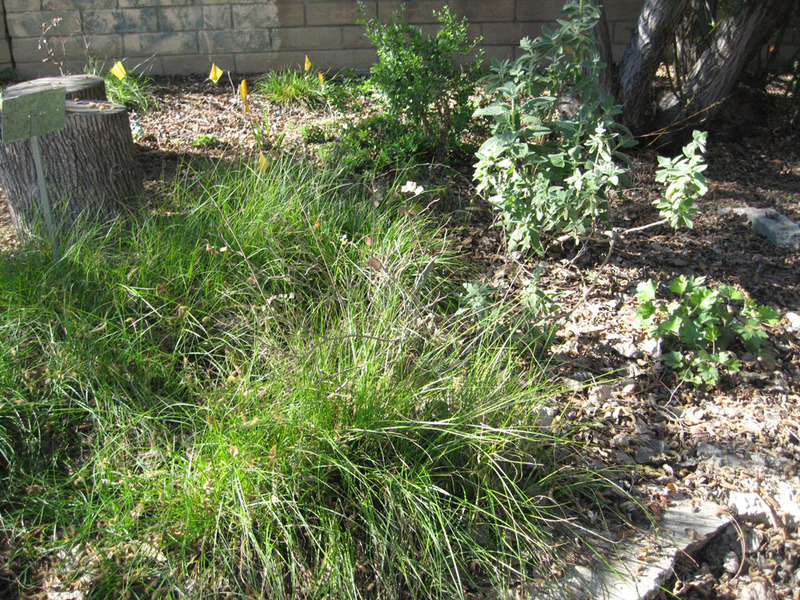 Carex praegracilis is a cool season, sod-forming sedge, so it does most of its growth in winter and spring in lowland S. California. It blooms in late spring or early summer. The blooms, on stalks that are somewhat taller than the leaves, are pale green, fading to tan fruits with white tips. The flowers and fruits are not particularly noticeable, although characteristic of the species; we’ll get some photos next year. For good photos see reference 5, below. 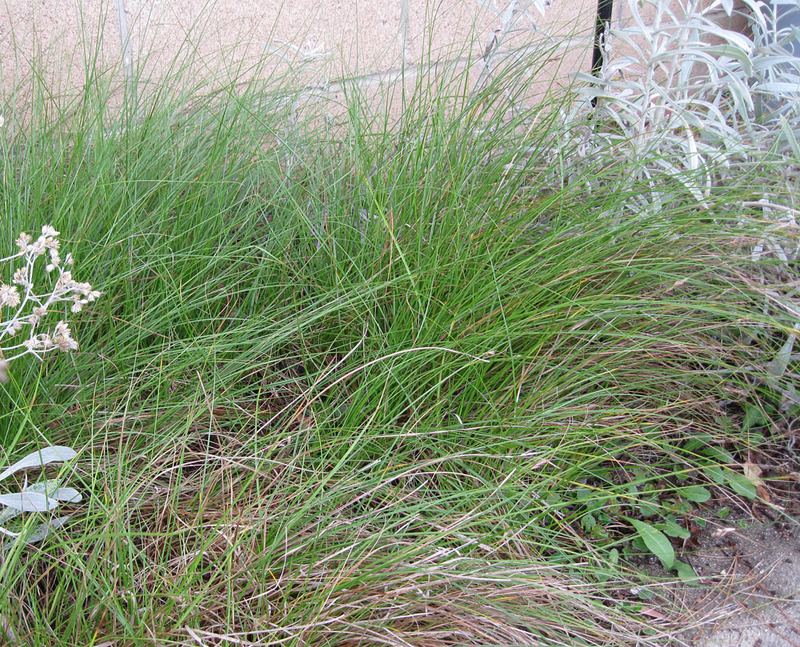 Clustered field sedge is worth considering when you want the appearance of ‘grass’ in an easy care, water-wise native. 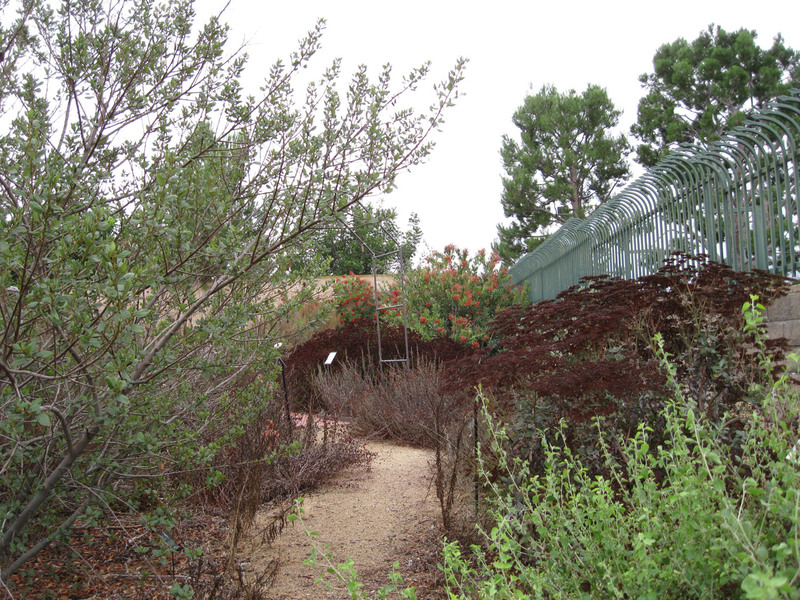 It’s very low maintenance; all that’s needed is to cut back to remove the brown foliage (if any) in late fall. If it spreads into areas where it’s not wanted, just pull out the young plantlets. 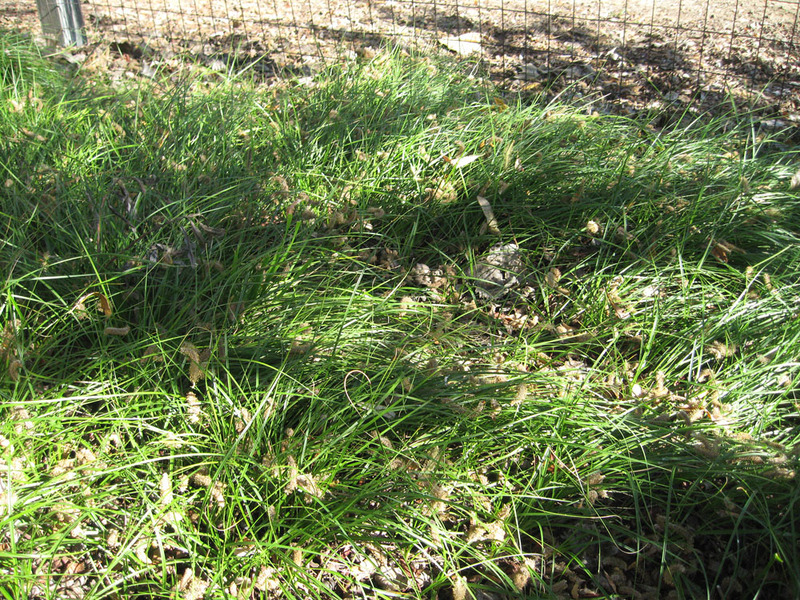 Clustered field sedge makes a good natural lawn substitute, and established plots can even be mowed (4-6 inches) several times during the growing season. Sedge lawns can be walked on, though probably not the best choice for heavy use. The sod grasses are still the best option for playing fields and other heavy traffic areas. But if you just need a water-wise, decorative green ‘lawn’, Carex praegracilis could be a good choice. 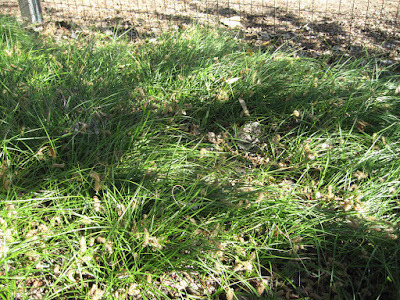 We like Clustered field sedge left un-mowed, allowing it to form a natural groundcover under and around trees/shrubs. It is a great natural groundcover for vegetated (infiltration) swales, and can be mixed with other groundcovers liking seasonal water. It does well on slopes and can be very useful there. 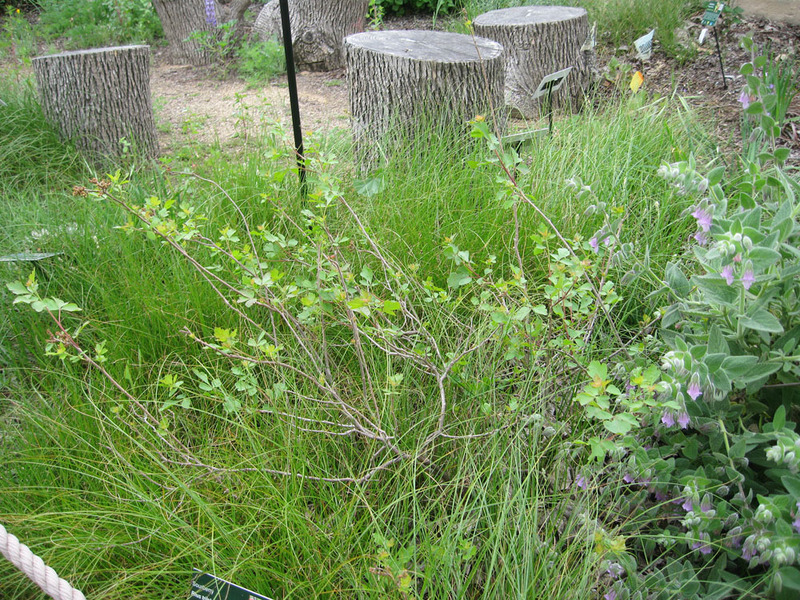 If watered, it can be used as a fire-resistant buffer plant in fire-prone areas. You can even grow it in a pot for spot of greenery on a shady porch. Incredibly adaptable and drought-resistant, Carex praegracilis may be just the plant you need to create a ‘green oasis’ in your water-wise garden. It’s locally native, delicate of appearance, yet tough as nails. It fills in between plants, providing needed contrast for other native plants. We couldn’t garden without it!